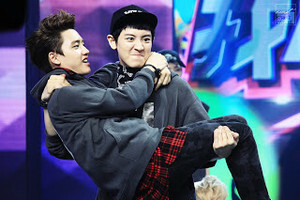 ♥ D.O & Chanyeol! ♥. . Wallpaper and background images in the D.O club tagged: exo d.o kpop ♦кyυηgsσσ♦ handsome wonderful kyungsoo soul-dragneel chanyeol. This D.O photo contains konzert. There might also be gut gekleidete person, anzug, hosenanzug, pantsuit, and gitarrist.